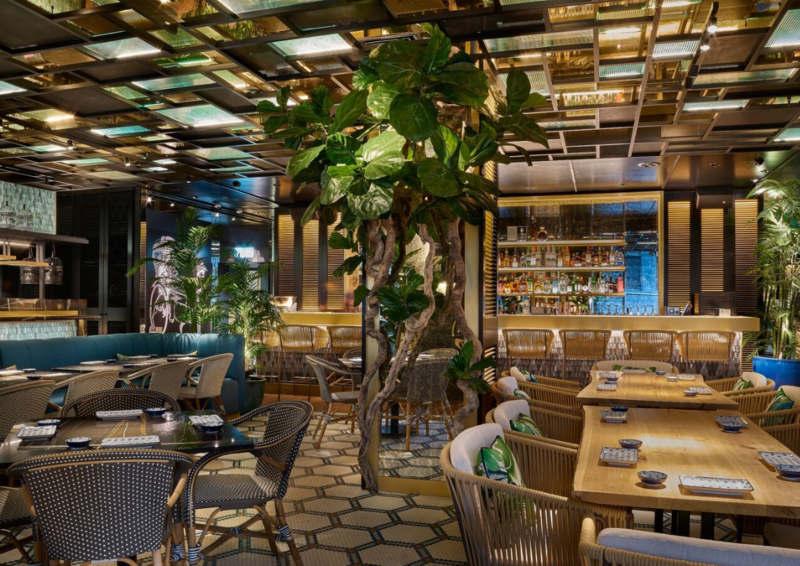 Located in the ME Hotel on one of London’s busiest thoroughfares is ZELA London, a Japanese Mediterranean fusion restaurant backed by legendary sports personalities and A-List music artists. Sensational interiors designed by Diego Gronda studio are unlike anything we have recently seen in London. Features include an abundance of lush greenery throughout the dining room, booth seating in original arch windows, a sushi bar and a stunning cocktail bar which runs the length of the restaurant. Finishing touches take influence from Spain with intricate floor tiling, bamboo furniture and palm print walls. Large windows flood the space with natural light while come evening; lighting is kept low to create a sophisticated ambience. ZELA’s menu is created by acclaimed Michelin starred chef Ricardo Sanz, whom has created the fusion menu of Japanese techniques and flavours applied to Mediterranean products and traditions. 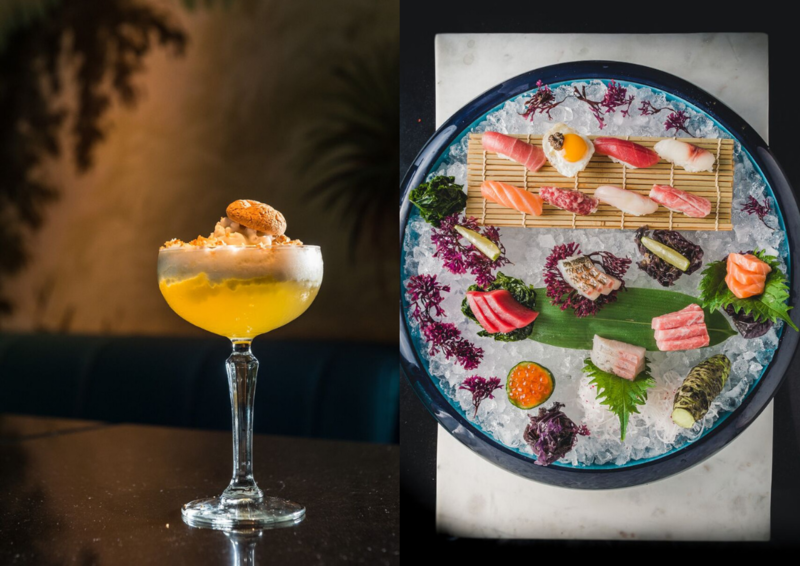 With an impressive menu, ZELA offers an array of fresh fish and seafood from the Mediterranean including their own style of raw dishes includes tatakis, tartars, sashimi, sushi, gyozas and tiraditos among others. 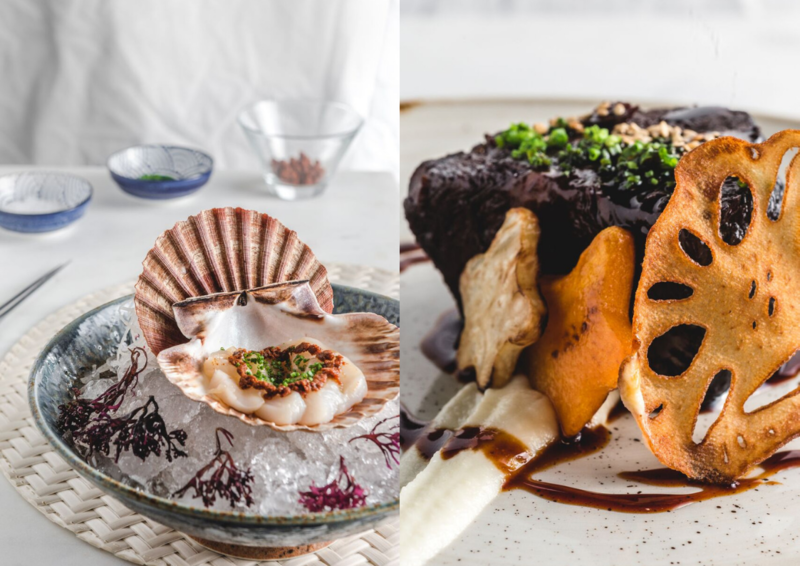 Signature dishes on the menu include scallops with Ibizan sobrasada and butterfish nigiri with white truffle. 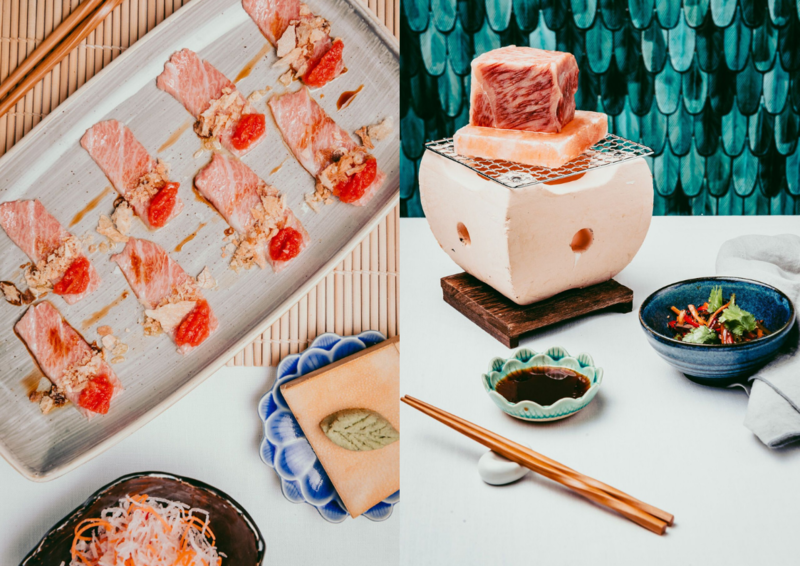 You can spot the Asian influences in dishes such as Iberico pork gyoza, usuzukuri toro pa amb tomaquet (thinly sliced tuna belly sashimi with grated tomato, olive oil and breadcrumbs) and 48-hour braised Wagyu teriyaki. In addition to the a la carte, a quick service set lunch and pre-theatre menu is also available offering four courses and a drink for £27, the perfect option for corporate lunch time dining/client entertaining. After carefully selecting a cocktail from the ZELA menu which balances Asian ingredients with the flavour of the Mediterranean (happy is daily from 5.30pm – 7.00pm by the way! ), we chose to begin our evening with a bowl of Miso onion soup and edamame with shichimi salmorejo. Refereshing and light but with plenty of flavour, it was a great start to the evening. With an amazing selection of vegetarian options, we ordered a plate of vegetarian sushi, Kappa Uramaki with avocado and cucumber and a side of order of vegetarian gyozas. Perfectly presented and not at all boring as some assume vegetable based sushi to be, it is obvious to see how much care and attention has been taken by the ZELA team to be inclusive in everything they have to offer. Finishing on charcoal grilled ribeye steak with soy garlic butter and miso black cod with kabocha gnocchi, kale and parsnip, we were extremely impressed with everything that came to our table. If you’re looking for an extraordinary experience in London, ZELA left us blown away. The interior design, the attention to detail on food and cocktails and the overall experience meant that we could not fault it. A wonderful venue that everyone should visit.